Ambassador Joel Toivola (1915-1999) worked for the Finnish Foreign Service in several important posts for more than three decades. He is especially remembered as a great friend of China and throughout his career encouraged relations between Finland and the People's Republic of China. Mr. Toivola served as the Ambassador of Finland to Beijing from 1961 to 1967. The Joel Toivola Foundation (formed in 2003) is an independent Finnish foundation. It commemorates Ambassador Toivola by supporting Finnish academic studies on China. The Foundation awards grants for talented young scholars in the field of humanistic or social science research on China. It also supports Finnish students' Chinese linguistic studies in China. For further information on the Joel Toivola Foundation, please contact Foundation's Executive Director, Mr. Mikko Eskola. 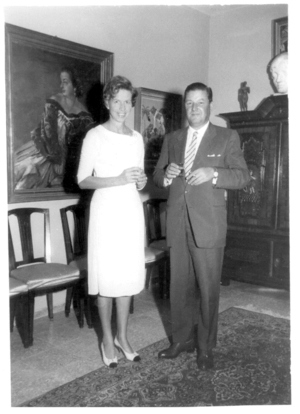 Chargé d'Affairs and Mrs. Toivola photograpted in the Finnish Legation in Tel Aviv in 1960. Mr. Toivola served in Israel from 1958 to 1961 being the second Finnish diplomatic representative in the country.